From just three operational malls in the early 2000s to over 600 operational malls by the end of 2017; this is the story of India’s great mall boom. And if one were to go by research reports from real estate consultancy firms, the story has just begun. In 2018 itself an estimated 7.8 million sft of space has been procured to construct shopping malls, the most since 2011. This, according to real estate service firm JLL, is 40% higher than 2017. The total newly completed mall space in 2017 was recorded at 5.6 million sft. Of the estimated 7.8 million sft, the largest contribution will be coming from the two southern cities of Hyderabad (2.2 million sft) and Chennai (1.5 million sft), which will see a significant influx of mall supply. Delhi NCR will be witnessing the highest supply of 2.3 million sft of new mall space in 2018, albeit recording a decline of 28% y-o-y since 2017. Most of these malls will be in the peripheral regions and would be catering to growing catchments of NOIDA, Gurugram and Greater Gurugram. Now consider the estimate that the next three years could see around 20 million sft of mall space hitting the market. The big developers, such as DLF, Prestige, Brigade Phoenix Mills, L&T, Nitesh Estates and a host of regional and local developers are building new malls. Property consultancy firm Anarock forecasts that 85 shopping malls will come in the next five years and that out of the 85 more than 30, accounting for almost 14 million sft area, will open in the top eight cities by 2020. “There is so much talk of the death of brick-and-mortar retail as a consequence of the aggressive advent of e-commerce in the country, when the fact is that shopping malls have just got started in India, and they are definitely here to stay,” says Anuj Kejriwal, MD and CEO of Anarock Retail. The estimates are not run-of-the-mill forecasts. Take for instance the forward-looking statements made by a few big developers. Blackstone-owned Nexus Malls is looking to add two million sft to its portfolio; Phoneix Mills, the largest mall owner, is looking to double its portfolio of over six million sft, and L&T Realty, the real estate arm of L&T, is building four malls in Hyderabad. This growth and future investments are not only limited to the metros. The emergence of tier II and tier III cities as future growth engines in the country is also prompting developers to target these under-penetrated markets and compete with online shopping portals. 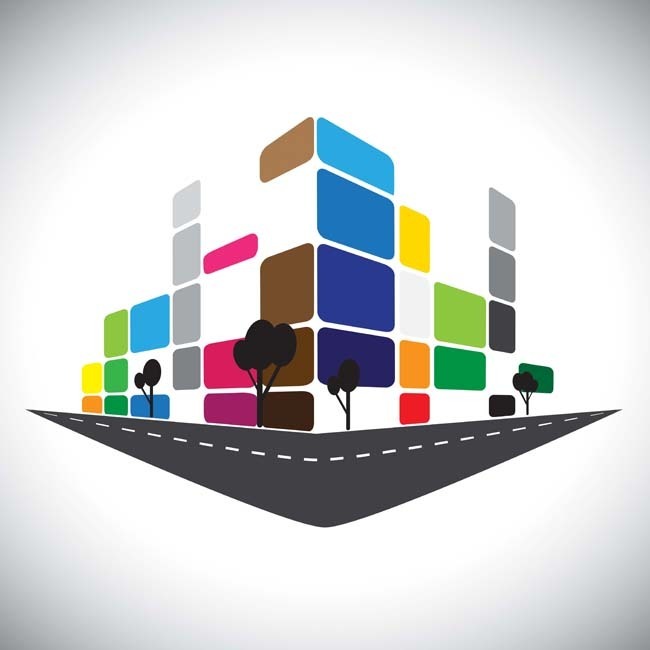 “Low vacancy levels and high rentals in tier I cities are also paving the way for retail expansion in tier II cities like Lucknow, Coimbatore, Chandigarh, Mangalore and Ahmedabad, to name a few. In fact, sensing immense opportunities and easy penetration into the Indian retail diaspora, overseas retailers are now expanding not just in metros but even tier II cities namely Ahmedabad, Jaipur, etc. This has led to mushrooming of malls all across the country,” reasons Kejriwal. 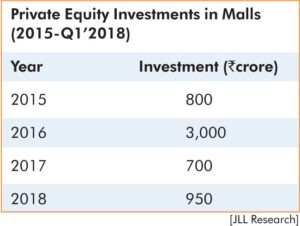 In fact, malls in tier II cities are clear favourites of PE firms. According to reports, Blackstone has bought malls such as AlphaOne in Ahmedabad, Elante in Chandigarh, and Treasure Island in Indore, besides owing 50% stake in a Pune mall. It is looking for opportunities in tier II cities in north and south India. As a matter of fact, Blackstone has acquired eight malls in the last two years and has a portfolio of over five million sft and plans to take this to seven million sft. As early as May this year, a two million sft mall in Chandigarh called North Country Mall, was bought by Virtuous Retail South Asia, a joint venture between Xander and Dutch pension fund APG, from Sun Apollo-Gumberg for `7 billion. Add to this CPPIB’s (Canada’s largest pension fund manager) announcement that it would invest an additional `9.38 billion in Island Star Malls Developers, the mall investment platform it co-owns with Phoenix Mills. While these point to the opportunities that lie ahead, the Indian mall story has also witnessed rationalisation. According to JLL, 2017 saw approximately five million sft of retail space being withdrawn with closing down of 28 malls. Most of the rationalisation took place in markets of Delhi NCR and Mumbai, owing to the fact that these markets have significant mall stock with a considerable percentage performing below par. While there has been a phenomenal growth of shopping malls, it’s not that all have survived the test of time. The ones which understood that they need to evolve, reposition and create a community experience have survived as well as thrived. They are now offering a holistic experience to the visitors. Successful malls such as Select City Walk are working on how to surprise the visitors with emotions. Mall developers know the growing clout of e-commerce and the threat it poses. Perhaps, it is this threat that has led developers to explore and focus on new categories, eg food and gaming. The rise of food-driven destinations such as Sangam Courtyard in Delhi and DLF Cyber Hub in Gurugram justifies the logic. Greater Noida’s Grand Venice Mall has been positioned as a mega tourist destination. The mall boasts of water canals and gondola rides, recreation of the Leaning Tower of Pisa, gigantic Roman sculptures, massive gaming zones, the largest food court in NCR, and an aquarium spread over one lakh sft, besides other unique features. It’s not just new malls that are re-imagining things to keep pace with the customer’s changing habits; the old ones too are going for makeover. Take for instance Delhi’s Ansal Plaza; it has re-emerged after a makeover and has now positioned itself as a gaming and food destination with a fashionable nightclub and the likes. Mall developers are on a steep learning curve as they try to figure out how to inspire customers, who are not just shoppers but experience-seekers, to not only stay longer but to return, says Puri. Anarock in its research report ‘Rebirth of Retail Malls: New, Improved & Revitalised’ stresses that experiential shopping – the new buzz word – is the key to success for retail malls. It touches upon the point that present days consumers/shoppers are looking for great shopping experiences and not merely closing transactions. To combat the onslaught of e-commerce the future of retail malls lies in the adoption/designing of new strategies to attract footfalls of old/first-time shoppers, and create an experience which in turn increases their repeat business. The era of ‘only shopping’ at a mall is a thing of the past. The report categorically highlights the fact that many malls have failed because of their focus only on the transaction and not on the experience. To stay relevant, Indian mall developers have adopted new-age technologies from the design and construction stage to the final end-user experience, which is what drives footfalls. 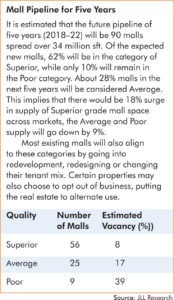 JLL in its report states that superior grade malls across the country will continue to enjoy near 100% trading occupancy, excellent consumption and steady rental growth. 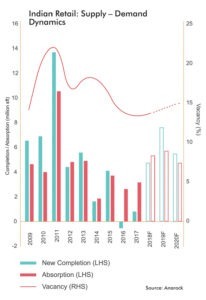 It is expected that there will be stock consolidation – some of the weak properties will divert to non-retail uses like small offices, hospitals, educational, healthcare and survive. The debate around online vs physical stores has been settled, and going forward it is omni-channel that will be the key sales strategy.